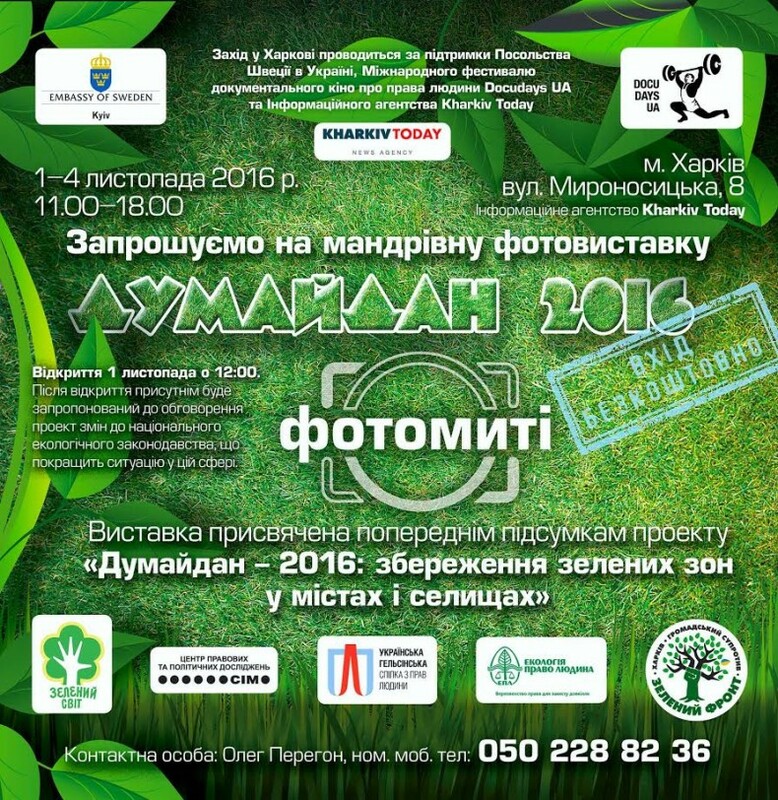 For almost half a year, in Ukraine, the large-scale and ambitious project “Dumaidan 2016” is being realized. The Project has joined forces of the most active environmentalists and the most professional lawyers – human rights defenders. As a result, the amendments to domestic laws should be adopted to protect our green areas. 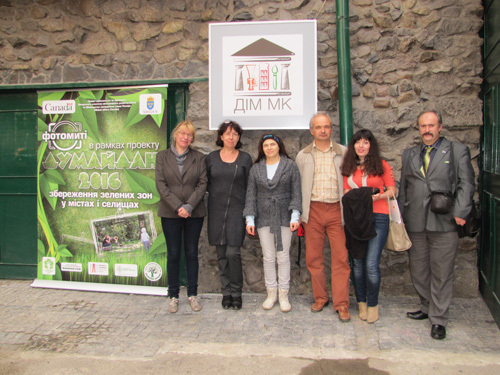 On October 2 in Kiev, the photo exhibition within the project was opened. Starting from November 1, this exhibition will be in Kharkiv. During the opening of the Kyiv exhibition, the planned amendments to the laws were discussed. 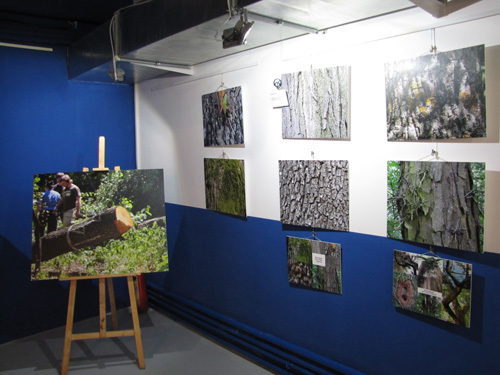 On October 2, in the MK House Gallery in Kyiv, the photo exhibition dedicated to the protection of green areas of Ukraine and their beauty, was opened. Indeed, Ukraine and Ukrainians are lucky: there are unique historical parks, gardens, and forest reserves in our cities, villages, towns. People love these natural places, as they are “green lungs”, holiday destinations and places of study and investigation of nature. Unfortunately, today these corners attract greedy entrepreneurs. To build up the area, to steal the wood, to take to pieces and to build castles there – these come to minds of fools, obsessed with money, who do not even realize that they encroach on the sanctuary of the people. Throughout Ukraine, almost every month the news tells about the confrontations of citizens and developers, land grabbers and those, who cut trees illegally. The environmental organizations have collected the pictures of these confrontations, as well as photos of the beauty of nature from different regions of Ukraine. There are photos taken in Kyiv, Kharkiv, Ternopil and more. 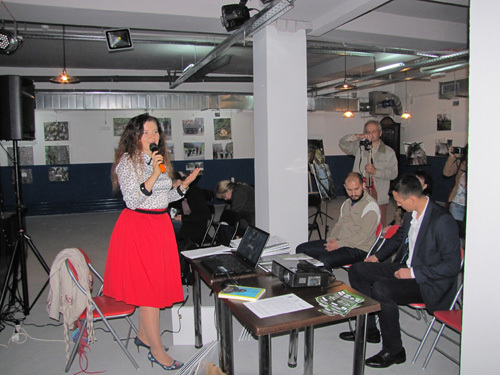 On October 2, the first part of the event was the presentation of the exhibition. The author of this article had the honor to make a speech at the opening. Also, several dozens of my works were shown in the exhibition. So I am very grateful to the organizers. The audience welcomed my photos, as well as photos of other authors. The comments of the media were also positive: (http://www.prostir.ua/event/dumajdan-2016-fotomyti/, http://dimmk.com/ru/workshop/vystavka-dumajdan-2016-fotomgnoveniya/,http: //precedent.in.ua/2016/10/03/dumajdan-vidkryv-fotovystavku/, many others). If we abstract from personal involvement, it should be noted that the exhibition combines art and reportage photos; it was dynamic and dramatic. In short, there is something to see for lovers of photography and environmentalists, activists, and just lovers of natural beauty. The second part of the event was the discussion of amendments to legislation that were produced by the previous participants of the project “Dumaidan” (more on this in our previous publications: http://www.zfront.org/dumaydan__2016/, http: //www.zfront .org / dumaydan-2016-fotomiti /). To do this, the activists from various organizations and initiative groups, including those, who rescued Ozero Kachyne [the Duck Lake] that traders with money suddenly attempted to fill and build up completely; activists, saving the Holosiivskyi forest and other patriots of the Ukrainian capital. If the previous event “Dumaidan” attended by representatives of Kyiv City State Administration, but this time the guests and participants of our discussion were members of the City Council, who were also advocates of green areas. The discussion went briskly and effectively; we collected a number of comments and additions from the participants that must be taken into account when drafting legislation. We invite all lovers of photography and nature, environmentalists, human rights activists to take part in the opening ceremony and (or) further discussion of amendments to legislation. They can be found here. Your suggestions and comments can improve all of our previous work because then we all live according to these laws! Later, our exhibition will visit Lviv, Ternopil, Ivano-Frankivsk, Odessa and other cities.